Buyers flock to this leafy Rivertown for several reasons, one is its rich assortment of classic architecture. This 1960s basic split needed some more warmth and character to compete, and needed it fast, as sellers were already in contract with their new house. Practically, this was a family of 5, with a busy lifestyle. They genuinely lived in every room, and there was sprawl: for example, musical instruments were set up/practiced on in half the rooms. Also, needed the girls to get, and stay on board: clearing out/parting with things, then doing their part to maintain a show-ready house. 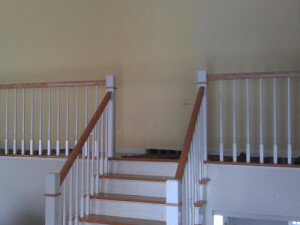 A new, classic wood stair rail replaced the builders’ original wrought iron work, adding warmth and architectural oomph. 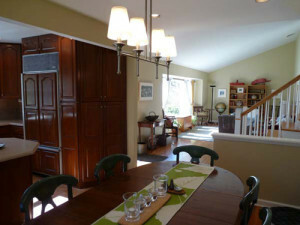 A chandelier replaced a high hat, transforming an eat-in kitchen to a dining area. 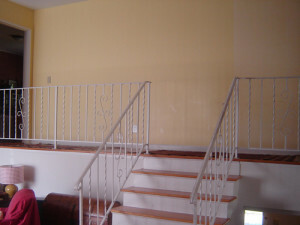 Removing wallpaper and painting every room made the house move in ready. 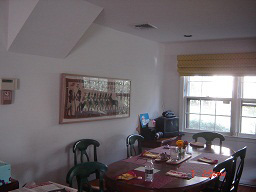 Dedicated spaces for the girls’ art and music were not only aspirational, the rooms read as orderly, AND their bedrooms were less cluttered-win, win and WIN! 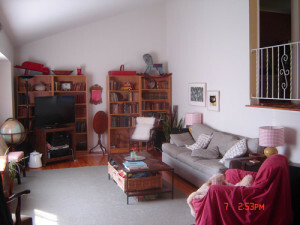 A deeper but warm tone in the living room reflected light and called attention to the drama of the space. Multiple offers first weekend. Best and highest got sellers 103% of ask, with fully executed contracts in hand in less than 3 weeks. Hope you enjoy seeing how we took so much of your advice! We will keep you posted. Brokers showing tomorrow and we already have one client coming right after that…. So we will see but we certainly feel prepared…all thanks to you! House went live early November. 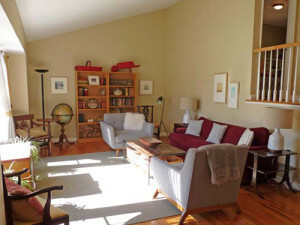 It had many showings and multiple offers. Sellers accepted an over-ask offer, had fully executed contracts in hand in 22 days, closed 3 weeks later.